*Lots 1, 4 and Valet have a limited number of spots. The fastest and easiest method of paying for parking is to pre-purchase your parking pass through www.ticketmaster.ca. We accept pre-paid passes, cash, debit, Visa, MasterCard and American Express. There are two available exits from Highway 417 that will lead you to Canadian Tire Centre; they are the Terry Fox Road and Palladium Drive exits. When using the Palladium Drive exit from Hwy 417 traffic may access the site in either northbound or southbound directions when arriving at Canadian Tire Centre. Find out more on our Directions Page. Tip: On game days or big event days the Palladium Drive North route has less traffic congestion. On these nights you should also allow yourself more time for traffic and parking. Arriving: Guests dropping off passengers may use Frank Finnigan Way located directly in front of Gate 1 at the Canadian Tire Centre. Coming from the east take the Palladium Drive exit from Highway. 417. Exit northbound (right). Follow the interchange and turn left onto Cyclone Taylor Blvd. Proceed to Frank Finnegan Way and turn right. Coming from the West take the Palladium Drive exit from Highway 417. Exit southbound (right) and follow the interchange to Huntmar Drive. Turn left onto Huntmar Drive. and turn right onto Cyclone Taylor Blvd. and merge right. Proceed to Frank Finnegan Way and turn right. Huntmar Drive northbound – turn right at the traffic lights at Huntmar Drive. Bus and recreational vehicle parking is $50 for full sized vehicles and $40 for half sized vehicles. Arriving: Coming from the East take the Terry Fox Drive exit from Highway 417 and turn left onto Terry Fox Drive. Turn right on Palladium Drive and proceed to Cyclone Taylor Blvd. Turn right onto Cyclone Taylor Blvd and take first left into Lot 6. Use the center cashier lane for payment upon entry and turn immediately to the right into designated bus parking area. All passengers are to be dropped off and picked up in this area only. Coming from the west take the Palladium Drive exit from Highway 417. Exit southbound (right). Follow the interchange, staying in the right-hand lane, and proceed straight through the traffic lights at Huntmar Drive and continue to Cyclone Taylor Blvd.. Turn left on Cyclone Taylor Blvd. and follow the above directions when entering Lot 6. Departing: Use dedicated lane within Lot 6 and merge into traffic on Cyclone Taylor Blvd when turning right out of Lot 6. Turn left (east) or right (west) onto Palladium Drive as traffic conditions permit. Limousines may drop-off and pick-up their customers in the valet drop-off area situated at Dodge Gate for a fee of $40. Pay the cashier in cash only the night of the event or purchase in advance, a package of 20 limousine passes from the Vinci Park office. These can be paid by company cheque or by cash. Drivers will drop off their customers at Dodge Gate. Once the passengers are dropped off, the drivers may not remain at Dodge Gate. They will then proceed to the booth at lot 2. (Cyclone Taylor and Huntmar) and pay the cashier a fee of $40. Immediately to the right of the booth, drivers will notice nine double parking spaces. The first limousine to arrive MUST park at the back of those spaces to allow room for all limousines. Limousine drivers who do not wish to stay for the duration of the event must still enter through Lot 2 and pay a fee of $40 upon their return and park in one of the spaces provided for you. All limousine parking spaces are available on a first come first served basis. Arriving: Coming from the East take the Palladium Drive exit from Highway 417. Exit northbound (right). Follow the interchange and turn left onto Cyclone Taylor Blvd. Remain in the left-hand lane. Have your parking pass ready for presentation to the lot attendant. Coming from the West take the Palladium Drive exit from Highway 417. Exit southbound (right) and follow interchange to Huntmar Rd. Turn left onto Huntmar Drive and turn right onto Cyclone Taylor Blvd. Merge into left-hand lane. Have your parking pass ready for presentation to the lot attendant. Departing: All traffic is directed right onto Cyclone Taylor. At Huntmar Drive you may turn either right (north) or left (south), and access your preferred route home. Either of these options will allow you to access Highway 417 via the Palladium Drive interchange. TIP – accessing the highway via the NORTH loop of the Palladium Drive interchange is typically faster. Arriving: Coming from the East take the Palladium Drive exit from Highway 417. Exit northbound (right). Follow the interchange and turn left onto Cyclone Taylor Blvd. Merge into the centre lane. Once you have passed the Lot 1/Valet Parking entrance, merge into the far right-hand lane. Have your parking pass ready for presentation to the lot attendant. Coming from the West take the Palladium Drive exit from Highway 417. Exit southbound (right) and follow interchange to Huntmar Rd. Turn left onto Huntmar and turn right onto Cyclone Taylor Blvd.. Merge into centre lane. Once you have passed the Lot 1/Valet parking entrance, merge into the far right-hand lane. Have your parking pass ready for presentation to the lot attendant. Departing: All traffic is directed left onto Cyclone Taylor Blvd. towards Huntmar Drive. At Huntmar Drive you may turn either right (north) or left (south), and access your preferred route home. Either of these options will allow you to access Highway 417 via the Palladium Drive interchange. TIP – arriving and departing traffic is often lighter on the NORTH loop of the Palladium Drive interchange. NOTE: In order to access Accessible Parking, patrons must present a valid government issued Accessible Parking Permit to the Lot 3 attendant, at which point you may either purchase a regular parking pass or present any pre-paid parking pass you may have already purchased. Arriving: Coming from the East take the Palladium Drive exit from Highway 417. Exit southbound (left). Follow the interchange and proceed straight through the traffic lights at Huntmar Drive. Merge into the left-hand lane. The Lot 3 entrance is on your immediate left-hand side. Have your parking pass ready for presentation to lot attendant. Coming from the West take the Palladium Drive exit from Highway 417. Exit southbound (right). Follow the interchange to Huntmar Rd. and proceed straight through the traffic lights. Merge into the left-hand lane. The Lot 3 entrance is on your immediate left-hand side. Have your parking pass ready for presentation to the lot attendant. Hwy 417 via Palladium Drive interchange – proceed straight through the traffic lights at Huntmar Rd. Huntmar Rd. southbound – turn left at the traffic lights at Huntmar Rd. Huntmar Rd. northbound – turn right at the traffic lights at Huntmar Rd. Cash parking in Lot 4 is $20, please be aware that for customers wishing to purchase Lot 4 parking upon arrival, availability is limited. Arriving: Coming from the east take the Palladium Drive exit from Highway 417. Exit southbound (left). Follow the interchange and proceed straight through the traffic lights at Huntmar Drive. Merge into the far right-hand lane. Have your parking pass or cash ready for presentation to the lot attendant. Coming from the West take the Palladium Drive exit from Highway 417. Exit southbound (right) and follow the interchange straight through the traffic lights at Huntmar Drive. Merge into the far right-hand lane. Have your parking pass or cash ready for presentation to the lot attendant. The Lot 4 exit onto Huntmar Drive has been reconfigured and has both dedicated right- and left-turn lanes. The left hand turn allows patrons to exit Lot 4 and proceed southbound on Huntmar Drive towards Maple Grove Road without merging with on-coming southbound traffic. The right hand turn allows patrons to exit Lot 4 and head towards Highway 417. Proceed straight on Huntmar Drive, through the Palladium intersection and take advantage of the new northbound traffic operation which sees two lanes heading northbound along Huntmar Drive from Cyclone Taylor Blvd. across the Highway 417 overpass to Campeau Dr. and around the newly constructed roundabout. From the roundabout, vehicles will have access to Highway 417 via the Palladium Drive interchange. By using the Huntmar Drive northbound route, you will avoid the delays being experienced when waiting to turn left onto Palladium Drive at the Huntmar and Palladium intersection. Arriving: Coming from the East take the Palladium Drive exit from Highway 417. Exit northbound (right). Follow the interchange and turn left onto Cyclone Taylor Blvd. and merge into the centre lane. Remain in this lane until you pass the Lot 2 entrance and then merge into the right-hand lane. Have your parking pass ready for presentation to the lot attendant. Coming from the West take the Palladium Drive exit from Highway 417. Exit southbound (right) and follow the interchange to Huntmar Rd. Turn left onto Huntmar Rd. and turn right onto Cyclone Taylor Blvd. and merge into the centre lane. Remain in this lane until you pass the Lot 2 entrance and then merge into the right-hand lane. Have your parking pass ready for presentation to the lot attendant. Departing: Two lanes of traffic exit from Lot 7. One lane will be directed left/west on Cyclone Taylor Blvd. towards Huntmar Rd. At Huntmar Rd. you may turn either right (north) or left (south), and access your preferred route home. Either of these options will allow you to access Highway 417 via the Palladium Drive interchange. One lane will be directed right/east on Cyclone Taylor Blvd towards Palladium Drive at Palladium Drive traffic will be directed to turn left onto Palladium Drive towards Terry Fox Dr. Proceed eastbound on Palladium Drive to Terry Fox Rd. For Hwy 417 access (eastbound or westbound), turn south (left) from Palladium Drive onto Terry Fox Rd. 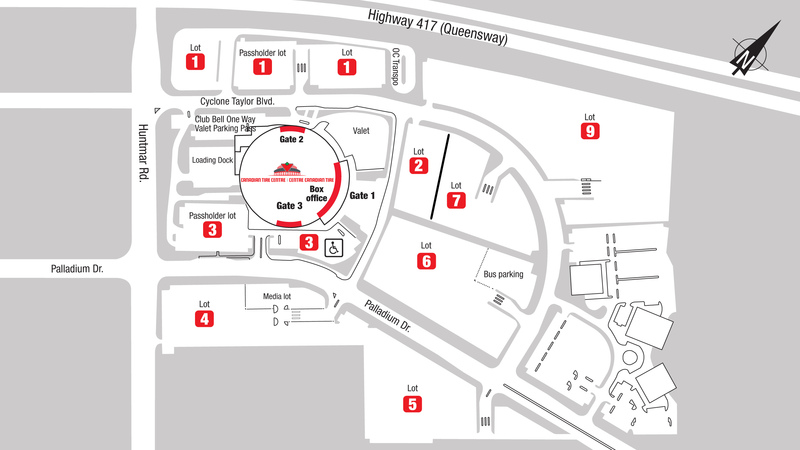 General Parking is in lots 5, 6 and 9 and is $20 for all Ottawa Senators games. As general parking is available on a first come first served basis, it is important to remember that Lots 5 and 6 will fill prior to an event start, but Lot 9 will not. Lot 9 can be accessed via Cyclone Taylor Blvd. from either Huntmar Rd. or Palladium Dr. Arriving: Coming from the east take the Palladium Drive exit from Highway 417. Exit southbound (left). Follow the interchange, staying in the right-hand lane, and proceed straight through the traffic lights at Huntmar Rd. Once you have passed the Lot 4 entrance, merge into the right-hand lane. The Lot 5 entrance will be on your right-hand side at the Palladium Dr./Cyclone Taylor intersection. The lot is full approximately 30 minutes prior to the event start. Coming from the west take the Palladium Drive exit from Highway 417. Exit southbound (right). Follow the interchange, staying in the right-hand lane, and proceed straight through the traffic lights at Huntmar Drive. Once you have passed the Lot 4 entrance, merge into the right-hand lane. The Lot 5 entrance will be on your right-hand side at the Palladium Dr./Cyclone Taylor intersection. The lot is full approximately 30 minutes prior to the event start. Departing: One lane of traffic exits right onto Palladium Drive at the eastern corner of Lot #5. Proceed eastbound on Palladium Drive to Terry Fox Rd. For Hwy 417 access (eastbound or westbound), turn south (left) from Palladium Drive onto Terry Fox Rd. 417 East and West access through parking Lot 4. Lots 4 and 5 are divided during the event. When leaving the division is removed approximately 10 minutes after the game ends. Customers can then use NEW lot 4 exit for access to 417 East and West. Arriving: Coming from the East take the Terry Fox Dr. exit from Highway 417 and turn left onto Terry Fox Dr. Turn right on Palladium and proceed to Cyclone Taylor Blvd. At the Cyclone Taylor/Palladium intersection there are three lanes of traffic. The left lane is for thru traffic. The two right lanes will be directed to turn right onto Cyclone Taylor Blvd. The centre lane shall be directed into Lot 6 or towards Lot 9 depending on the traffic flow. The right-hand lane will be directed towards Lot 9. The lot is full approximately 30 minutes prior to the event start. Coming from the West take the Terry Fox Dr. exit from Highway 417 and turn right onto Terry Fox Dr. Turn right onto Palladium Drive and follow the above directions once on Palladium Dr. Departing: Two lanes of traffic exit right onto Cyclone Taylor. Arriving: Coming from the East take the Terry Fox Dr. exit from Highway 417. Turn left onto Terry Fox Dr. Turn right on Palladium and proceed to Cyclone Taylor Blvd. At the Cyclone Taylor/Palladium intersection there are three lanes of traffic. The left lane is for thru traffic. The two right lanes will be directed to turn right onto Cyclone Taylor Blvd. From Cyclone Taylor Blvd., the centre lane will be directed into Lot 6 or towards Lot 9, depending on the traffic flow. The right-hand lane will be directed towards Lot 9. Coming from the West take the Terry Fox Dr. exit from Highway 417. Turn right onto Terry Fox Dr. Turn right onto Palladium Drive and follow the above directions once on Palladium Dr. The two right-hand lanes are directed right onto Cyclone Taylor Blvd. towards Huntmar Rd. At Huntmar Rd. you may turn either right (north) or left (south), and access your preferred route home. Either of these options will allow you to access Highway 417 via the Palladium Drive interchange. The two left lanes are directed left onto Cyclone Taylor towards Palladium Dr.
Southwest corner of Lot 9 – two lanes of traffic depart via this exit. All traffic from this exit is directed right onto Cyclone Taylor towards Huntmar Rd. At Huntmar Rd. you may turn either right (north) or left (south), and access your preferred route home. Either of these options will allow you to access Highway 417 via the Palladium Drive interchange. For customers wishing to purchase valet parking upon arrival, availability is limited. It is best to arrive by 5:30 p.m. to ensure access. Arriving: Coming from the east take the Palladium Drive exit from Highway 417. Exit northbound (right). Follow the interchange and turn left onto Cyclone Taylor Blvd. and merge into the right hand lane. The valet parking entrance will be on your right at Lincoln Gate. Coming from the West take the Palladium Drive exit from Highway 417. Exit southbound (right). Follow the interchange and turn left onto Huntmar Rd. Merge into the right-hand lane. Turn right onto Cyclone Taylor Blvd.. The Valet Parking entrance will be on your right at Dodge Gate. The entrance to Valet Parking is located on the right directly outside Lincoln Gate. Departing: Two lanes of traffic are directed left onto Cyclone Taylor towards Huntmar Rd. At Huntmar Rd. you may turn either right (north) or left (south), and access your preferred route home. Either of these options will allow you to access Highway 417 via the Palladium Drive interchange.